Dr. Lateef discussed his music at the Detroit Jazz Festival. During a few quiet moments before taking the stage at the Jazz Workshop in November 1972, Yusef Lateef sat in a corner surrounded by his instruments as he read a book called “Symbolic Logic.” A performer and educator, he was studying for a doctorate and made use of every available free moment. On stage that night, as with his many other performances, he swiftly focused the audience’s attention on the kind of music most people called jazz, a term he would soon abandon. A masterful musician on the tenor sax, flute, and oboe, he incorporated scales and instruments from Africa, Asia, and the Middle East. Four decades ago, he was introducing audiences to what is now called world music, before the term entered critical parlance. Dr. Lateef, who taught for many years at the University of Massachusetts Amherst, died Monday in his Shutesbury home, his website announced. He was 93. 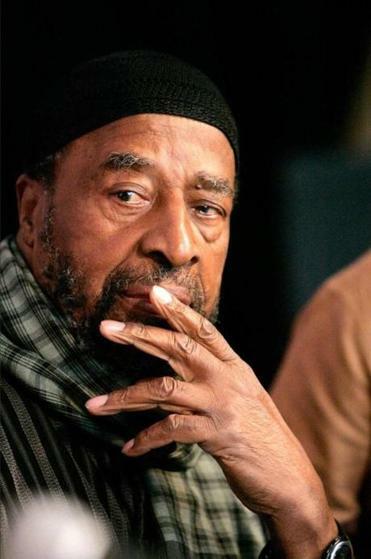 Awarded a Grammy in 1987 for “Yusef Lateef’s Little Symphony,” an album on which he played all the instruments, Dr. Lateef received a National Endowment for the Arts Jazz Masters fellowship in 2010. Dr. Lateef’s performing career, which stretched from the late 1930s until this year, included performances with many of the biggest names in jazz, including Charles Mingus and Dizzy Gillespie, whose band he joined in the late 1940s. At the Newport Jazz Festival 50 years ago, Dr. Lateef attracted notice as part of the Cannonball Adderley Sextet. “Stealing much thunder from the incredible Cannonball was versatile Yusef Lateef, who can manipulate more horns than an army of Newport-bound motorists,” Globe critic Harvey Siders wrote in July 1963. For Dr. Lateef, playing an array of instruments was a way to find his own musical voice. Although he performed under the name William Evans early in his career, Yusef Lateef said in interviews and on his website that he was born William Emanuel Huddleston in Chattanooga, Tenn., on Oct. 9, 1920. In a 2008 interview with Marc Myers for the website www.jazzwax.com, Dr. Lateef said he was an only child and moved with his parents to Lorain, Ohio, and then to Detroit in 1925. As an adolescent, he lived above a Detroit theater and would go downstairs to listen to the house band. By 12 he wanted to be a musician, but had to wait several years to afford an instrument. He split the cost of an alto saxophone with his father and began playing at 18. Influenced by the tenor playing of Lester Young, Dr. Lateef switched to the larger saxophone a year later. After performing on the road with Gillespie’s band, he returned to Detroit when his first wife became ill, in order to take care of her and their two children, and worked at a Chrysler auto manufacturing plant for a few years. He was in his late 40s when he went to the Manhattan School of Music, from which he received a bachelor’s degree and a master’s degree. He graduated from UMass Amherst with a doctorate in 1975 and began teaching there. Dr. Lateef’s first wife died, as did two of his children, according to his website. At the time of his death, Dr. Lateef was a professor emeritus, and throughout his life spirituality was an important avenue into music. Along with recording numerous albums of his own music, and with other musicians, Dr. Lateef published novellas, collections of short stories, and “The Gentle Giant,” a 2006 autobiography he wrote with Herb Boyd. According to his website, Dr. Lateef leaves his wife, Ayesha; a son, Yusef; a granddaughter; and several great-grandchildren. Calling hours and a prayer service were held Thursday in Amherst. In the 1999 Globe interview, during the early years of the Internet, Dr. Lateef was already sounding an alarm about the pitfalls of having access to too much music while trying to develop a unique style. Bryan Marquard can be reached at bmarquard @globe.com.